Thank you to Quinn Invisible‘s author, Amy Martin, for sending me a free copy of this book in exchange for a review. I’m actually pleasantly surprised by Quinn Invisible. I absolutely devoured it within the space of two days and I’m extremely pleased to hear that there will be more books centered around Quinn. 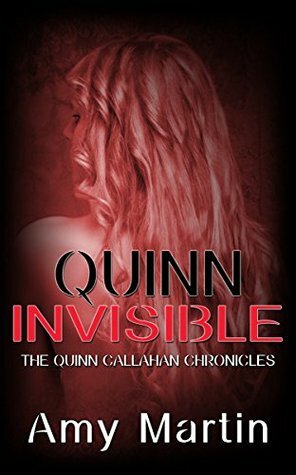 You all know how much I adore my Gillian Flynn novels and Quinn Invisible was just as addictive. I could not put it down. It’s everything you could want in a young adult thriller. There’s humour in the form of Quinn’s new friends Seti and Hal, Quinn’s romance with Evan and load of plot twists that I’m dying to tell you about but can’t! Quinn’s quest to prove that her mother is innocent had me hooked. Everyone loves a good old whodunnit mystery and the fun that comes along with it. Following the clues, conjuring up our own theories and gasping when we’re proven wrong…or perhaps even right. There’s no way I could’ve guessed the ending to Quinn Invisible. I think the reveal was just as shocking to Quinn as it was to me. However, the icing on the cake has to be the wonderful characters that Amy Martin has created. Quinn is snarky and headstrong, but I think almost everyone can see a bit of themselves in her and that’s why you really do root for her. Even at the start when all the odds seem to point to the fact her mum is guilty. I wish Hal and Seti were my best friends! I felt like climbing into the book and dragging them right out! Alas, I must talk about Evan. Oh, Evan. There I was promising myself I wouldn’t fall for any more fictional guys and then along comes Evan Thalmann. Evan started off being a little bit of an arse to Quinn, but then he started being all charming and well, how could I and Quinn even resist? I loved the dynamic between Evan and Quinn. They wormed their way into my hearts which is why I may have shed some tears towards the end. Even Seti knew that it wouldn’t end well and was doomed from the start, but a girl can hope. I’ll be praying to see more of them in the second Quinn Callahan novel because their chemistry was electric. Amy Martin has definitely earned herself a new fan! I’ll eagerly be waiting for the sequel.